There's some glitch in posting, Devoted Readers, so please scroll down past a repeat for the post on Jayne Wrightsman's jewels coming up at auction. for a Southampton showhouse in the mid-1980s. Albert Hadley celebrated his inspirations for design with his famous pin-up bulletin boards. The one in his office that was covered with images clipped from mazazines and newspapers that inspired his design sensibilities became very popular and a similar feature was often requested by clients for their own homes. After all, interiors are not so much about the designer as they are the design. Mr. Hadley was familiar with the great designers, cetainly, but provenance did not carry as much weight as an object with its own personality. Albert Hadley's bookcase from the mid-1930s. A drawing by Van Day Truex hangs adjacent. Despite his love of the unique, Albert Hadley was not adverse to reproductions. Durning my tenure at Parish-Hadley, we often had one-of-a-kind pieces of furniture designed and fabricated, of course. (In the early 1990s, there was even a small Parish-Hadley collection for Baker Furniture company). But also for Parish-Hadley clients, some of Mr. Hadley's designs were made in limited editions as were some pieces from his own collection of antiques. 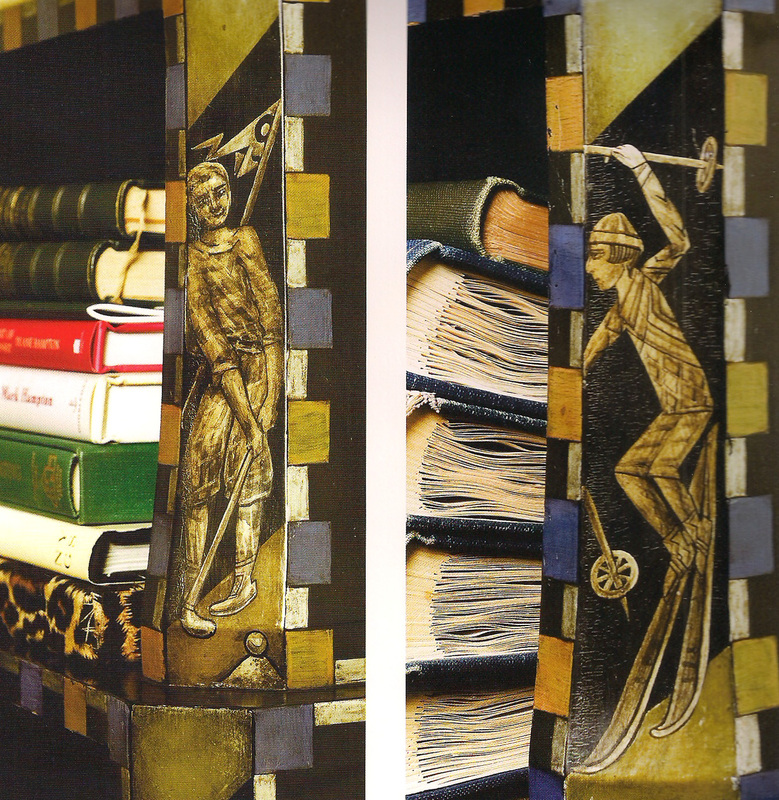 One item reproduced was a very unique bookcase made in Germany in the mid 1930s and decorated with Olympic motifs. Details of the decoration on Albert Hadley's bookcase. It was not unusual for rare and costly antiques to be brought to the Parish-Hadley office for client presentations, but this piece was brought in for Michael T. Shell to measure and draw to scale for a copy to be made, but I do not recall anymore details. Although I really liked the form, I would have thought it would have limited marketability. It just goes to show what I know, however, because there are not just one but two models based on Albert Hadley's bookcase currently being marketed. The Olympia Etegere by Beeline Home. 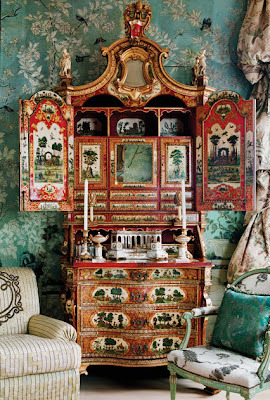 It is no secret that The Devoted Classicist considers Bunny Williams one of today's finest decorators, and now a dealer of her own line of home furnishings as well. Bunny worked for Parish-Hadley for over twenty years, so it is not surprising that her version by her furniture company BeeLine Home captures the essence of the original. 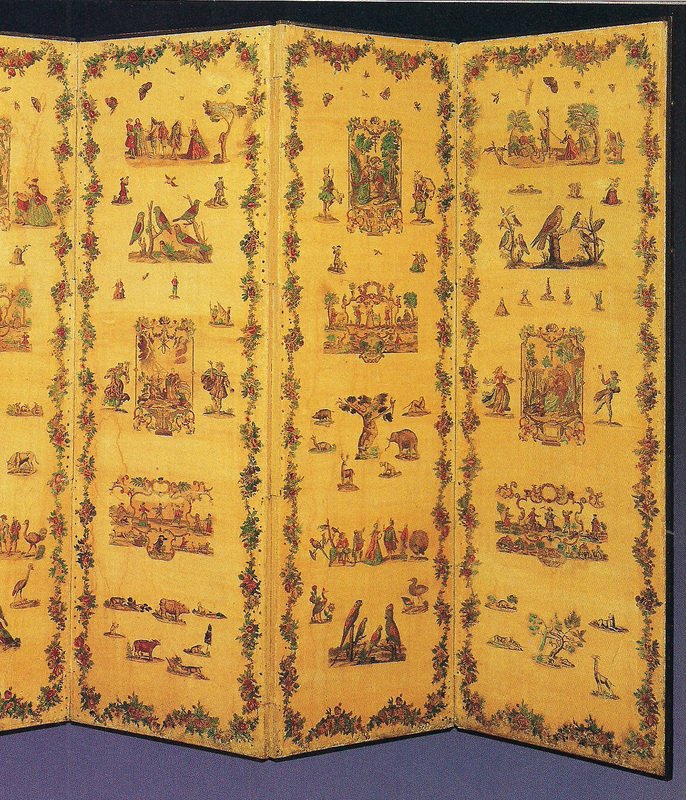 In reference to the decoration of the original, it is called the Olympia Etegere. The Roosevelt Bookcase by Noir. 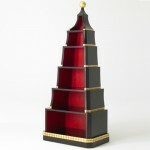 A very similar model has been introduced by Noir, but a bit more vertical than pyramidal. 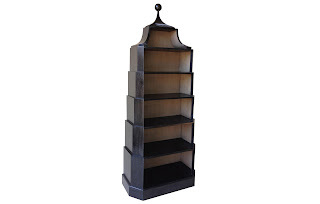 Simplified but undeniably inspired by the same original, it is called Roosevelt Bookcase. Would the late Mr. Hadley be pleased that one of his favorite belongings has inspired a whole pyramidal bookcase movement? I think so. Adam Lewis' book ALBERT HADLEY: THE STORY OF AMERICA'S PREEMINENT INTERIOR DESIGNER may be ordered at a discount here. My own pyramidal bookcase with steeply sloped sides for Parish-Hadley clients probably will not see mass-market production. It will be featured in a future post of The Devoted Classicist, however. 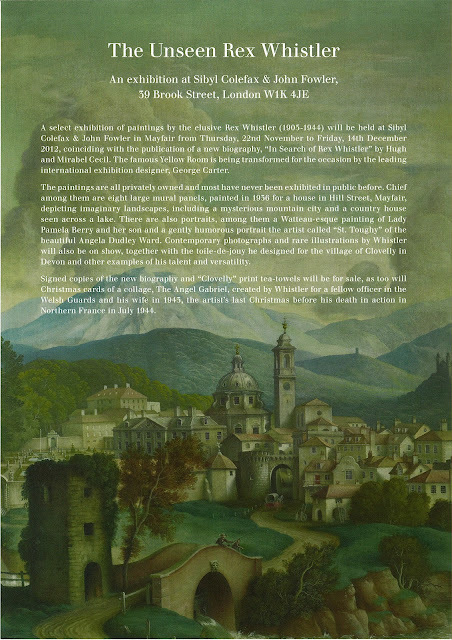 Devoted Readers looking for that special gift will be interested in the December 5, 2012, Sotheby's auction Magnificent Jewels From The Collection Of Mrs. Charles Wrightsman. Those casually interested in the decorative arts might not recognize the name, but Jayne Wrightsman and her late husband have been incredibly influential collectors and philanthropists. The thirteen Wrightsman Galleries at the Metropolitan Museum are appreciated by thousands each year. of her former Palm Beach home. 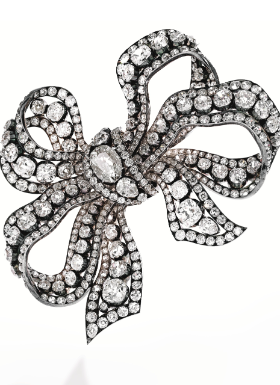 The auction will end with the sale of Lot 380, estimated $200,000 to $300,000, a diamond bow brooch with an Imperial Russian association. 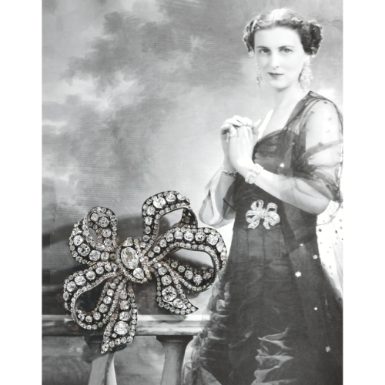 The rare mid-19th century brooch was once in the collections of Grand Duchess Elena Vladimirovna of Russia, the granddaughter of Tsar Alexander II, and her daughter HRH Princess Marina, Duchess of Kent. Princess Marina, whose father was Prince Nicholas of Greece and Denmark, grew up in Paris after the overthrow of the Greek monarchy. She was married to Prince George, Duke of Kent, from 1934 until his death in 1942 while in active service with the Royal Air Force. (According to author Hugo Vickers in ELIZABETH, THE QUEEN MOTHER, the Duchess was "the only war widow in Britain whose estate was forced to pay death duties"). 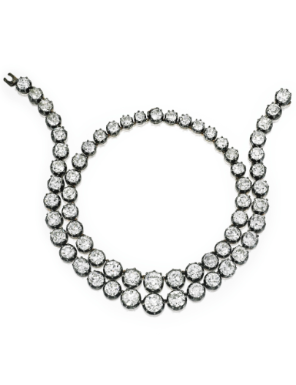 The lot with the highest estimate, $800,000 to $1,200,000, however, is Lot 378, a pair of diamond rivieres, a type of necklace (or bracelet) with the stones mounted on the back to leave them as visible as possible. These rivieres are not from the collection of Princess Marina, it is thought, but very similar to a pair worn in a 1949 portrait by Cecil Beaton. 1949 portrait by Cecil Beaton. First cousin to Prince Philip, Duke of Edinburgh, Princess Marina became his aunt also after his 1947 marriage to Prince Elizabeth, now Queen Elizabeth II. 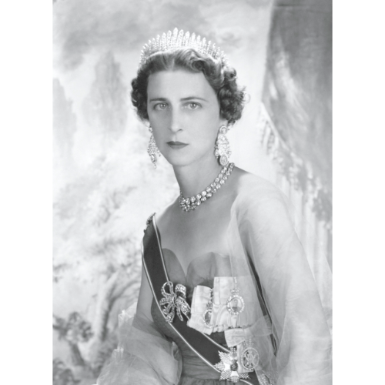 Princess Marina was a popular and active member of the British Royal Family, sometimes serving as representative of the Queen in foreign celebrations and ceremonies. She died of a brain tumor in 1968 at age 61. (Her son is the sometimes controversial but popular Prince Michael of Kent, but that is the subject of another post entirely). Filoli, a magnificent estate about 35 miles south of San Francisco famous for its gardens, is normally closed to visitors during the winter. An exception, however, is the annual, week-long series of events called Holiday Traditions. For 2012, the dates are November 23 through December 1. See the website for more information and reservations. 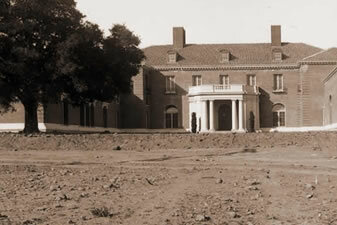 The main house as it appeared in 1921. Construction on the main house was started in 1915 and the Bourns occupied it in 1917 althugh some work on finishing details continued for a few more years. The architect was Willis Jefferson Polk, 1867 to 1924, who had also designed the Bourns' cottage in Grass Valley and their house at 2550 Webster Street in San Francisco. Although not having a formal education, Polk was a respected figure in San Francisco, playing an integral role in the rebuilding after the 1906 earthquake and acting as the supervising architect for the 1915 Panama Pacific International Exposition. Also, Polk (related to President James Knox Polk) was the associated architect for Carolands, the mansion in nearby Hillsborough that was completed in 1914. (But that is the subject of another post). Bruce Porter helped plan the extensive formal gardens. Both Mr. and Mrs. Bourn died in 1936. Mr. & Mrs. William P. Roth, owner of the Matson Navigation Company involved with Hawaiian freight shipping and tourism, bought the estate in 1937. The estate remained well-tended and the formal garden gained national recognition during the Roth's ownership. 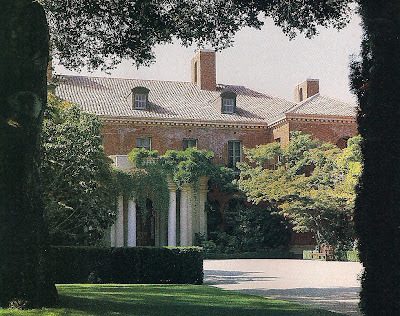 Mrs. Roth lived there until 1975 when she donated 125 acres containing the house and formal garden to the National Trust for Historic Preservation and the remaining acreage to a non-profit organization, Filoli Center. 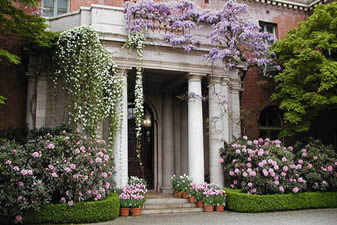 The entrance to the main house, Filoli. Photo: John Vaughan for Architectural Digest. When the estate was originally open to the public, the main house was closed at first, then open but shown unfurnished. After a donation of Roth furnishings in the mid-1980s, a three year refurnishing project overseen by Anthony Hail, one of San Francisco's most respected interior designers. (See Anthony Hail's decoration of Guigne Court on a previous post of The Devoted Classicist here). The first floor rooms were presented as an interpretation of a sophisticated, California country house. 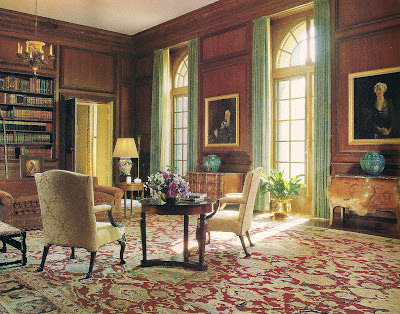 Although Anthony Hail's schemes have now been lost to a great extent, some rooms were photographed for the May, 1989, issue of Architectural Digest and shown as follows. 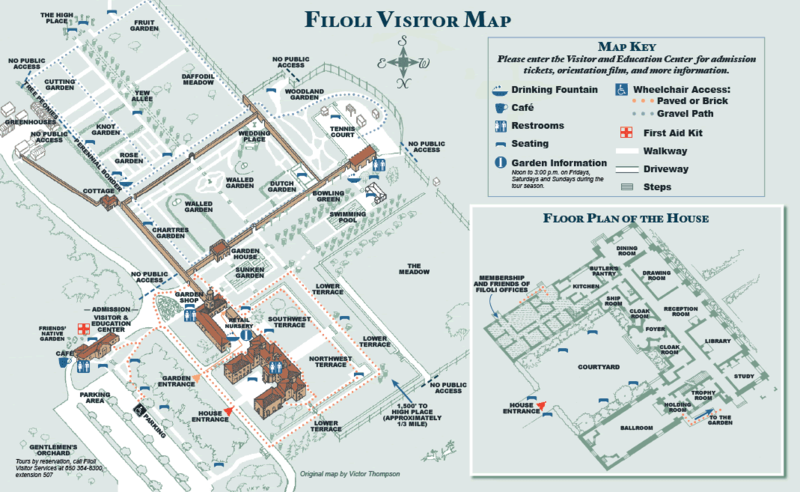 For comparison, current views of the rooms may be seen on the Filoli website here. showing figures donated from the Roths' collection. The Reception Hall, on the garden side of the house directly opposite the main entrance, was used for smaller scale entertaining as well as for receiving guests for the grander events. The original wall covering of grasscloth silkscreened with an Italian Renaissance pattern remains in place along with the original curtains. 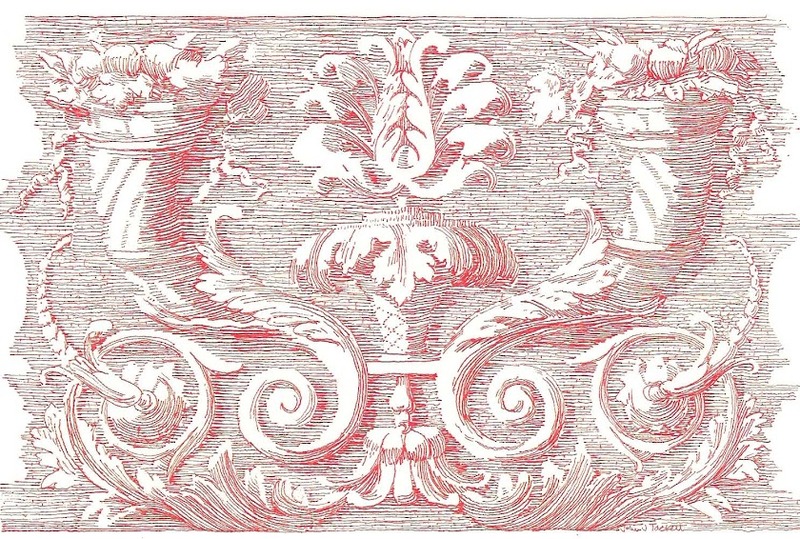 The tapestry above the fireplace, an 18th century Italian chimneypiece of Carrara marble inlaid with Verona marble, belonged to both the Bourns and the Roths. as decorated by Anthony Hail. Used as a Ladies' Withdrawing Room after dinner by the Roths, Mrs. Bourn used it as a Music Room. The original curtains of Italian silk woven with a colorful floral pattern can be glimpsed in the reflection of the Adam style mirror which is also among the 1917 furnishings, along with the chandeliers and sconces. 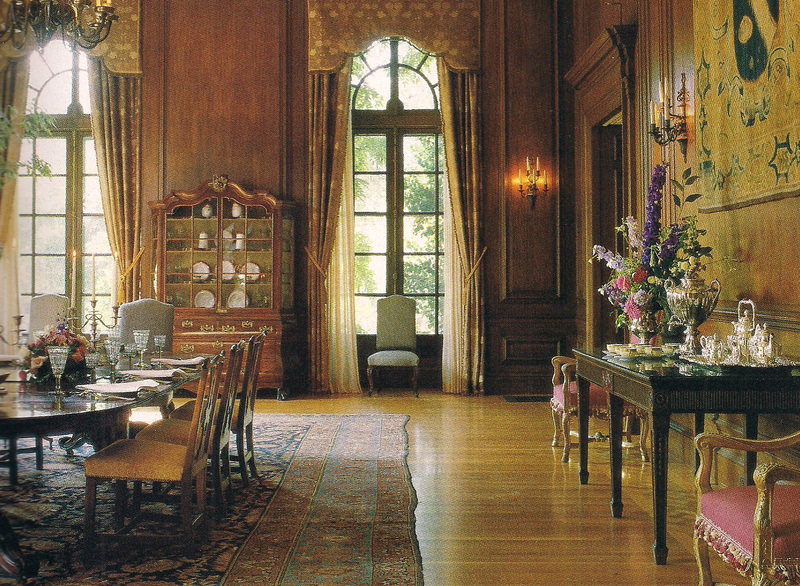 In the oak-panelled Dining Room, the mauve floral silk curtains are original as is the dining table. 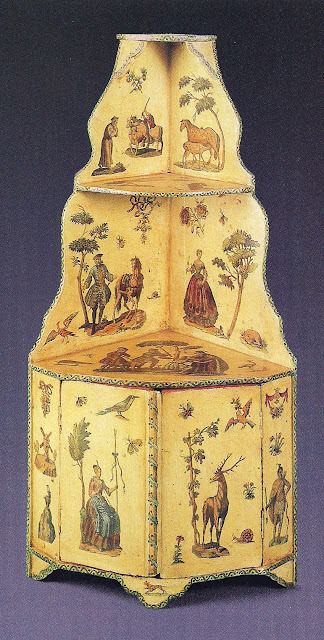 The cabinet displaying china had belonged to Mrs. Roth's mother. Photo by John Vaughan for Architectural Digest. 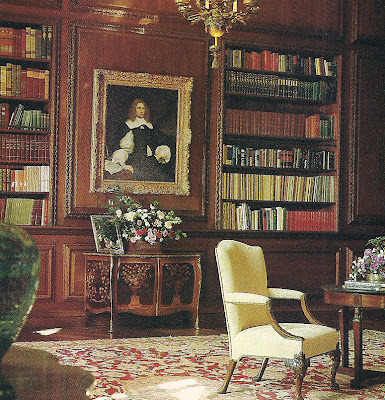 The details of the panelled Library of American black walnut are said to be copied from Denham Place, England, built in 1690. The Isfahan pattern Agra carpet is said to have been made for Osborne House, Isle of Wight; it was purchased in England by the Bourns. Some of the books belonged to the Bourns, and others, the Roths, supplemented by others that were donated. The Study/Sitting Room was originally a home office for Mr. Bourn. A concealed door to the right of the fireplace opened to a safe that was replaced by a wine closet for the Roths; the door to the left that had opened to a closet for business records was converted to a bar. 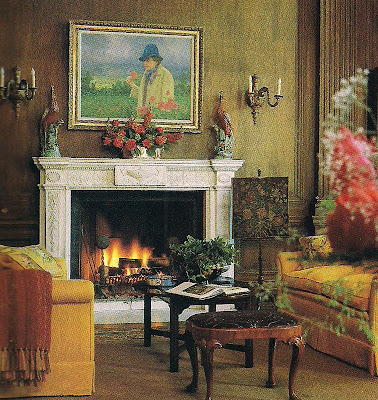 The portrait over the Carrara marble chimneypiece portrays Mrs. Roth, painted by Lloyd Sexton in 1981.
as it appeared during the Anthony Hail refurbishing. showing a representation of the Bourn grandchildren. 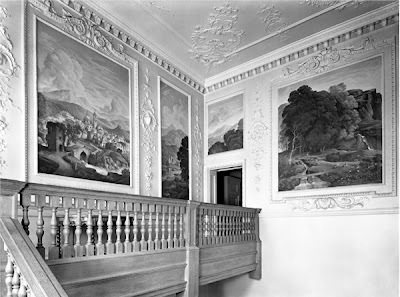 The decoration of the Ballroom was completed in 1926 with the murals painted by Ernest Peixotto, a San Francisco-born artist and writer. 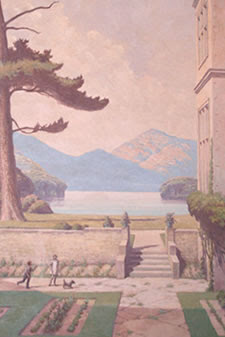 The scenes were painted in the artist's New York City studio from sketches Peixotto had made on site of Muckross Abbey and Upper Killarney Lake. 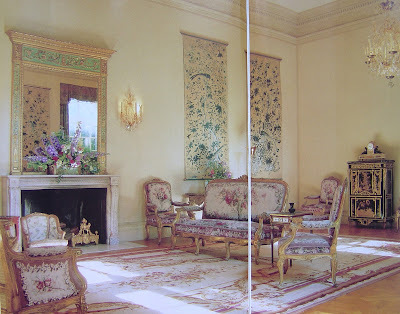 The "water-green" color of the panelling was specified by Mrs. Bourn who also insisted on the gold-leaf highlights that were said to be in conflict with Mr. Peixotto's vision of the decor. 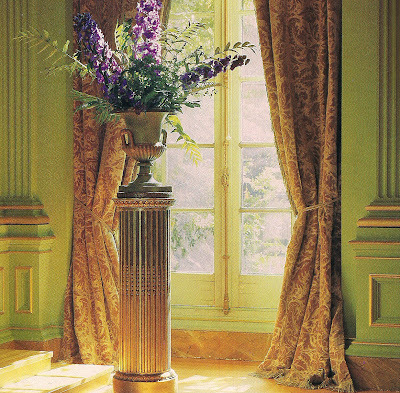 The chandeliers and wall sconces of amethyst-colored crystal were chosen in Paris by Peixotto and the Bourns' daughter, Maud Vincent. The curtains of cut velvet woven with gold and silver metallic threads and metallic fringe have undergone two rounds of conservation. 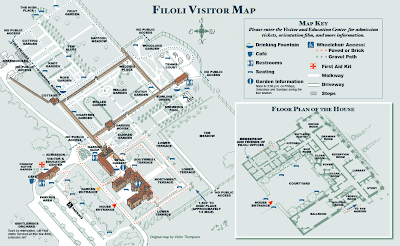 All 654 acres of the estate and buildings are now operated by Filoli Center. 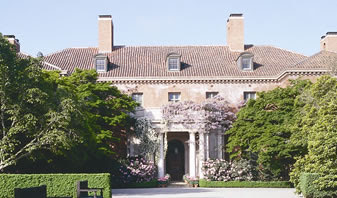 In addition to serving as a tourist destination and educational facility, Filoli is often used as a location for filming motion pictures and television shows. 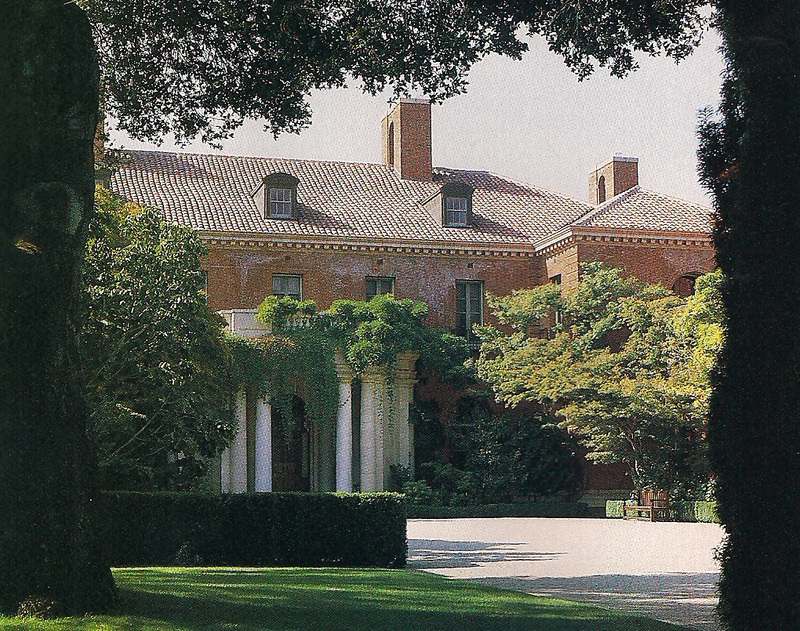 Perhaps most famously, the exterior served as the palatial home of the Carringtons in the 1980s series "Dynasty." For information to plan a visit, see the Filoli website. 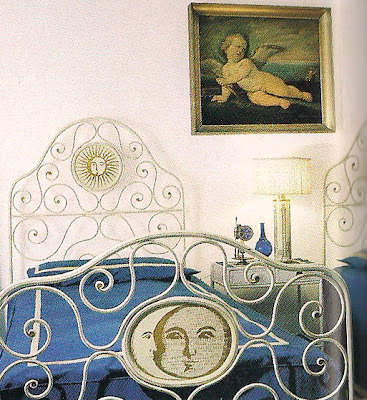 of the late Piero Fornasetti. Photo by Robert Emmett Bright. 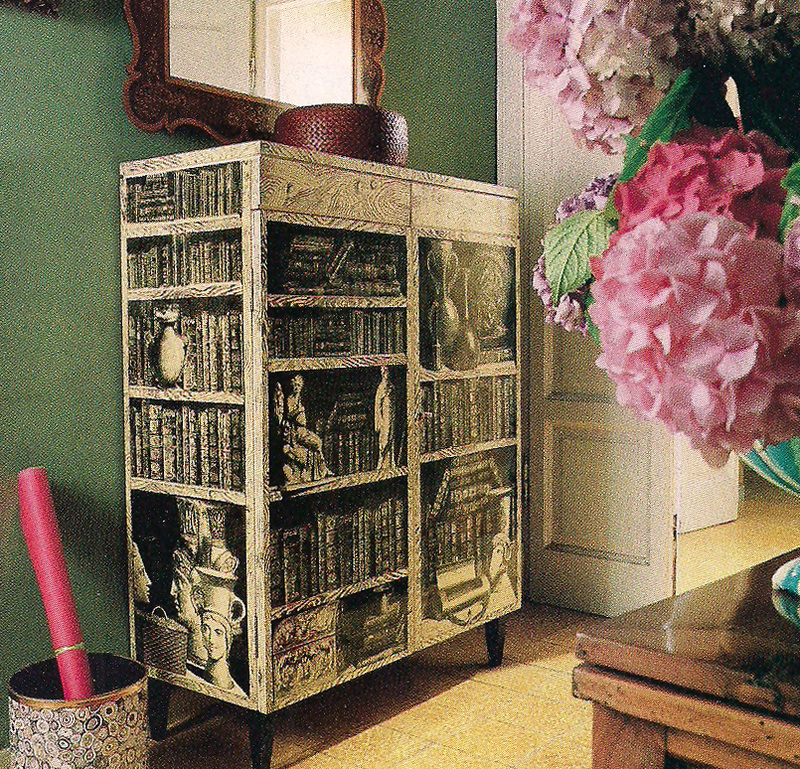 One of The Devoted Classicist's favorite furnishings designers by far is Piero Fornasetti. Although inspired by classic historicism, Piero Fornasetti, 1913 to 1988, was one of the most innovative designers of the second half of the 20th century. a finger of Lake Como, Italy. After exile in Switzerland during World War II, Piero Fornasetti returned to Italy and began to renovate the summer villa that had been built by his father in 1899. 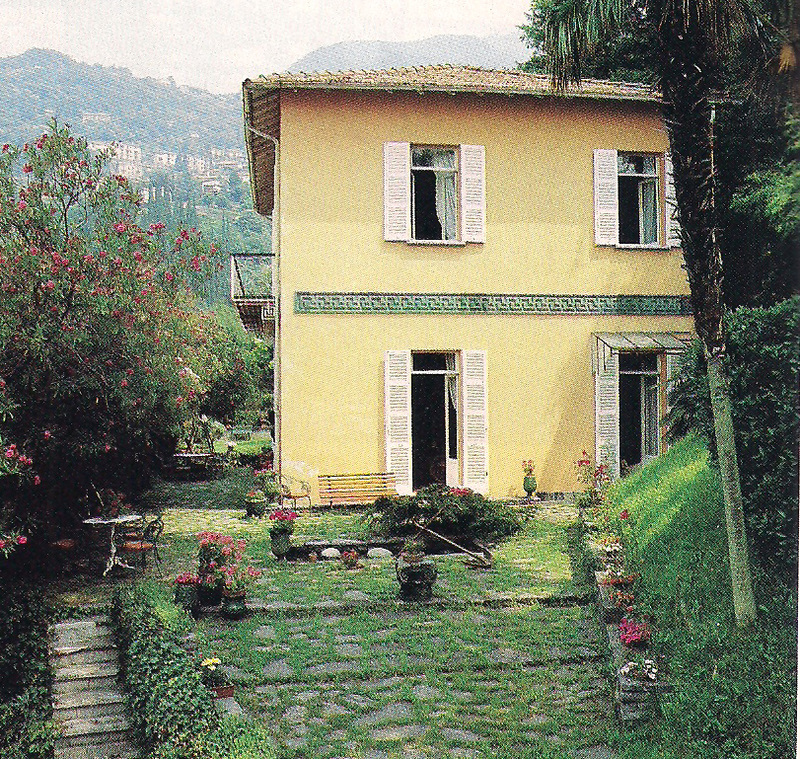 Near the village of Varenna on Lake Como, it is about an hour by train from Milan. The terrace is decorated by a pair of carved figureheads. 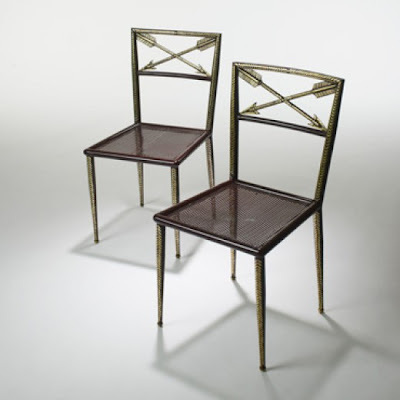 The table and chairs were designed by Fornasetti in 1955. 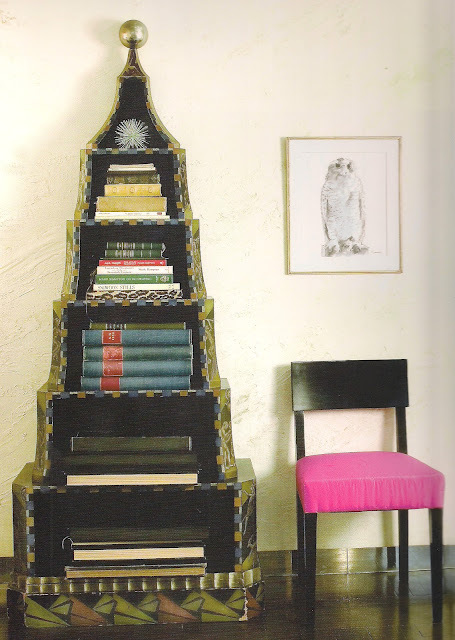 Set on a small level shelf on the steep slope rising up from the lake, Fornasetti made only a few changes to the simple exterior. A frieze of glazed terra-cotta tiles and brackets for the balcony, both with a Greek key motif, were added by Fornasetti. The interior was completely transformed, however. The Living Room at Villa Fornasetti. 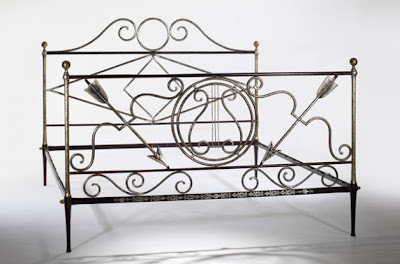 In the Living Room, Fornasetti painted the tubular metal furniture to resemble bamboo. Additional seating includes several antique neo-classical chairs and a pair of bentwood rockers. An old frame was made into a mirror flanked by obelisk lamps made in 1955 and a 1930s self-portrait was hung over his 1954 "Como Leopardo" commode. with an estimate of $20,000 to $30,000. 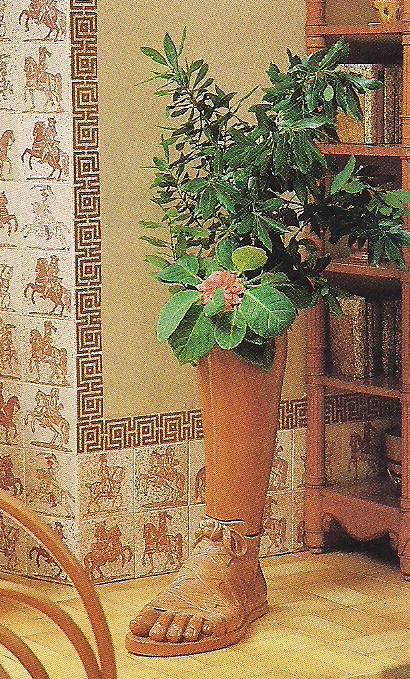 He also designed the red equestrian tiles inspired by 17th century prints bordered by a stencilled fret that trims the Living Room. 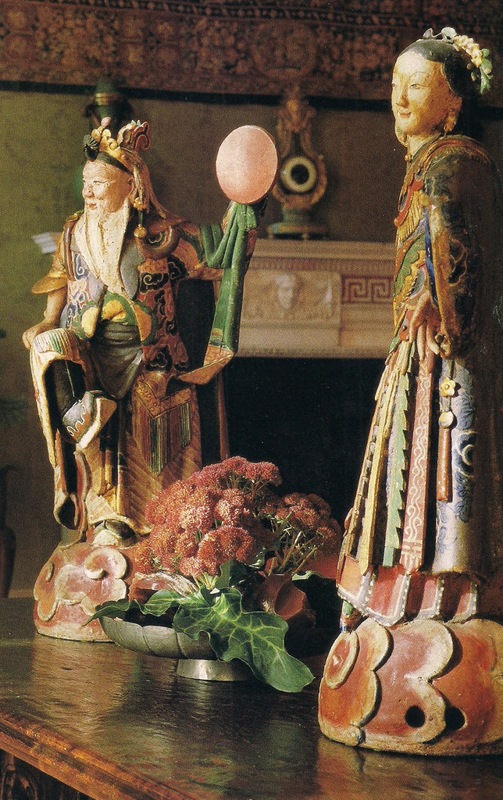 A life sized Roman foot from 1955 is ceramic with a terra-cotta finish and used as a vase. Just glimpsed through the doorway is the Entrance Hall covered with a specially created deep yellow paper. 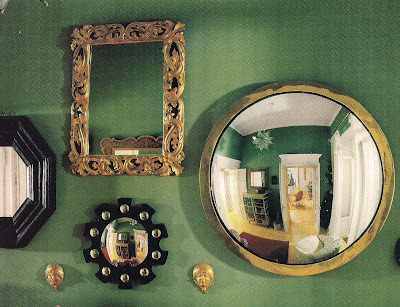 The green room, a guest room in the first photo displays an assortment of mirrors, some made by Fornasetti, and others, antique. The Guest Room at Villa Fornasetti. The 1953 cabinet in the guest room is decorated with Fornasetti's ideal of classical antiquities and books arranged on shelves. The round container by Fornasetti dates from 1955. The Dining Room at Villa Fornasetti. The Dining Room walls are painted an intense blue in contrast to the sunny colors of the Living Room. Thousands of shells ordered from Venice were glued to the walls by son Barnaba over two summers. 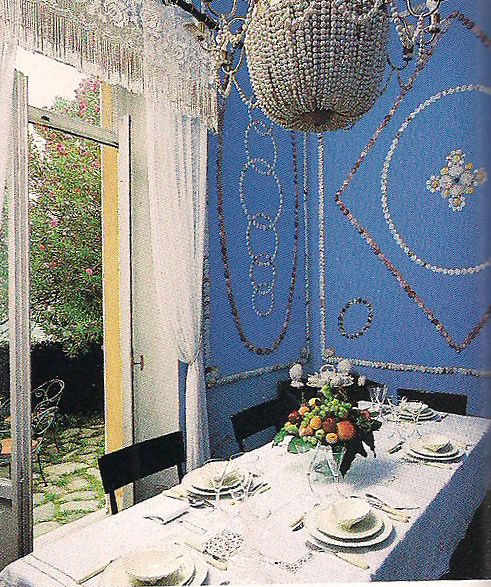 Giula Fornasetti, the artist's widow, made the shell chandelier. The Master Bedroom at Villa Fornasetti. The yellow Master Bedroom featured an antique Scilian wrought iron bed that the artist restored and embellished. Fornasetti designed the coordinating side chairs, the 1954 wardrobe covered in neo-classical images, the ceramic nubian vase, and the blue convex mirrors. May 18, 2008, with an estimate of $20,000 to $30,000. with an estimate of $15,000 to $20,000. 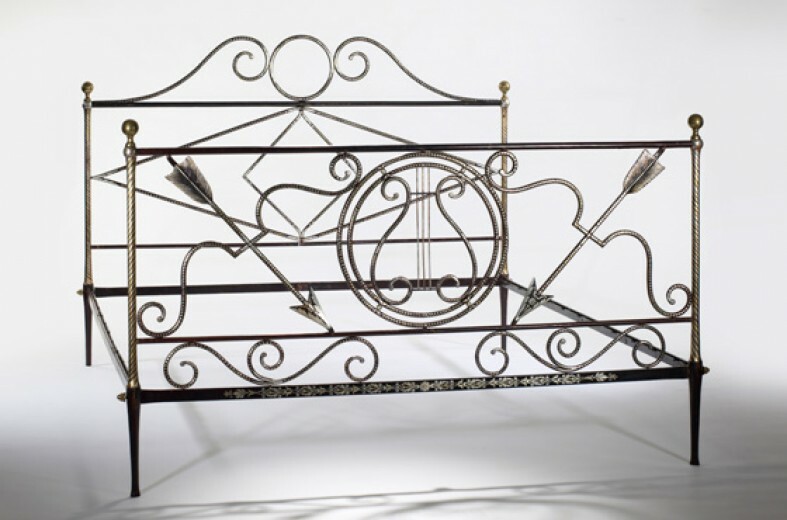 As a side note, the bed from Villa Fornasetti was sold was sold at Wright for $21,900, but it appears that the chairs did not sell. 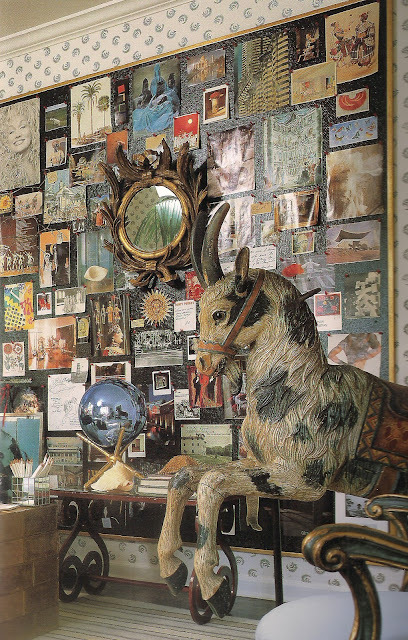 The son's bedroom at Villa Fornasetti. 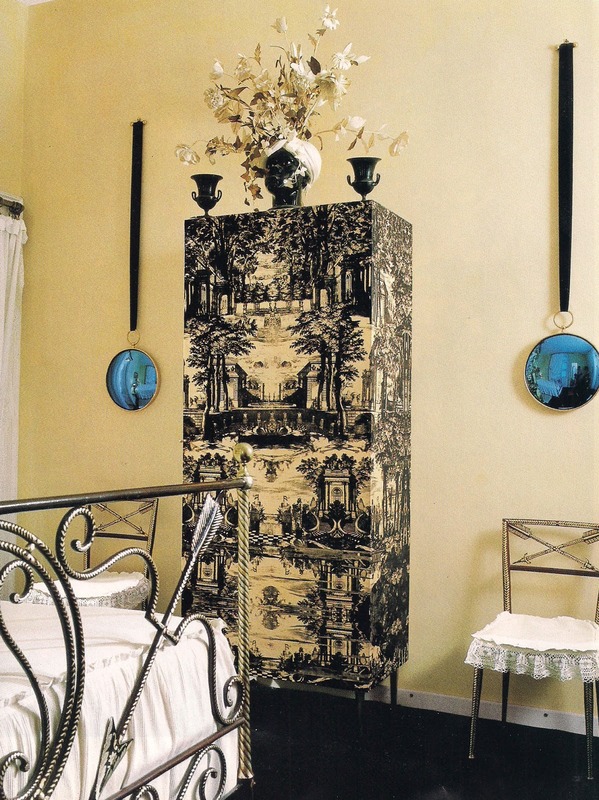 Barnaba's bedroom featured a pair of bedsteads painted by Fornasetti and his cylinder lamp with Trajan's column motif. 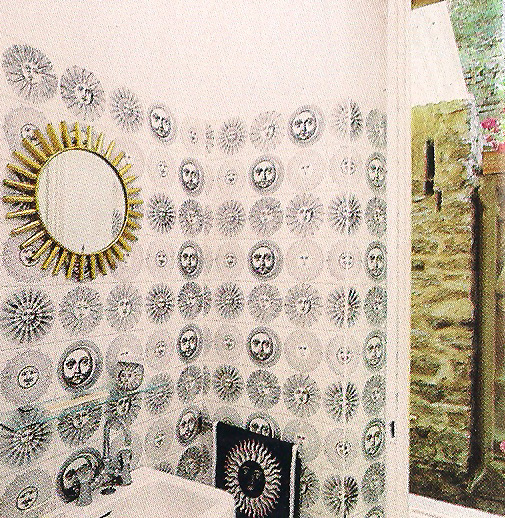 A bathroom at Villa Fornasetti. A bathroom is tiled with in designs from Fornasetti's "Soli e Lune" series of 1953. 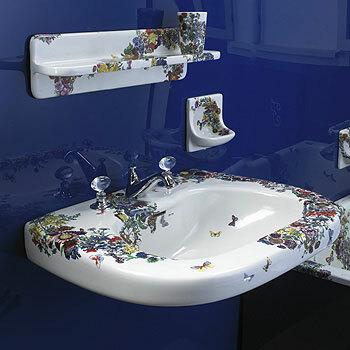 Another bathroom had white walls but featured plumbing fixtures, including the toilet and bidet, decorated with sprays of flowers in Fornasetti's design. 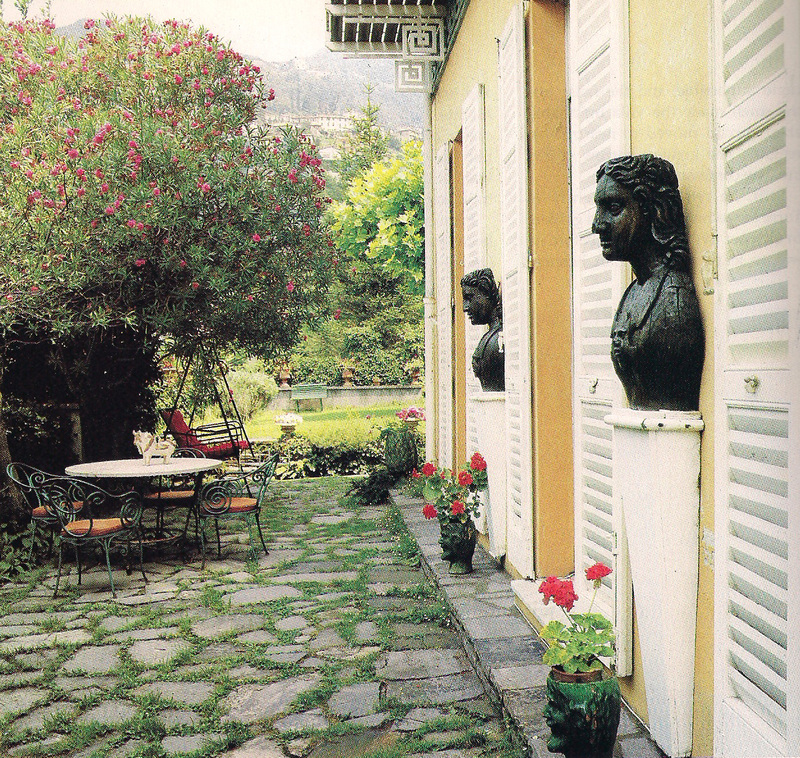 After Piero Fornasetti's death, his son Barnaba took over the business with his mother serving as consultant. 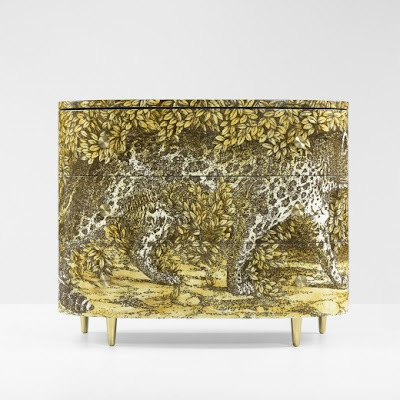 Some items designed by Piero Fornasetti are still being produced in limited editions, joining earlier products found in antique shops and auctions that still enjoy favor from collectors. 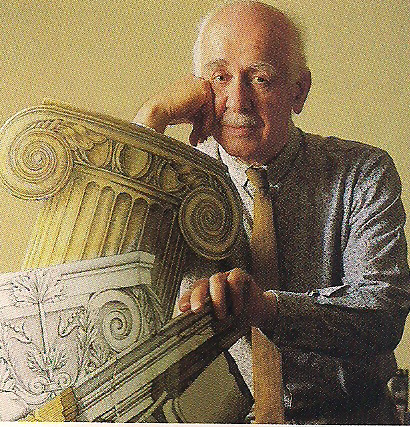 Piero Fornasetti in a photo from the late 1970s. The flagship Fornasetti store is in Milan, but new products are also sold in retail shops around the world. 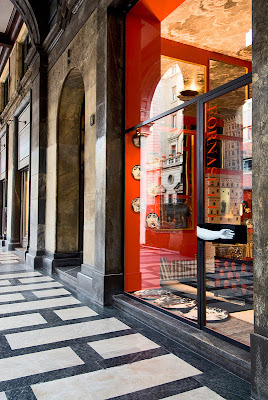 The exterior of the Fornasetti shop in Milan. 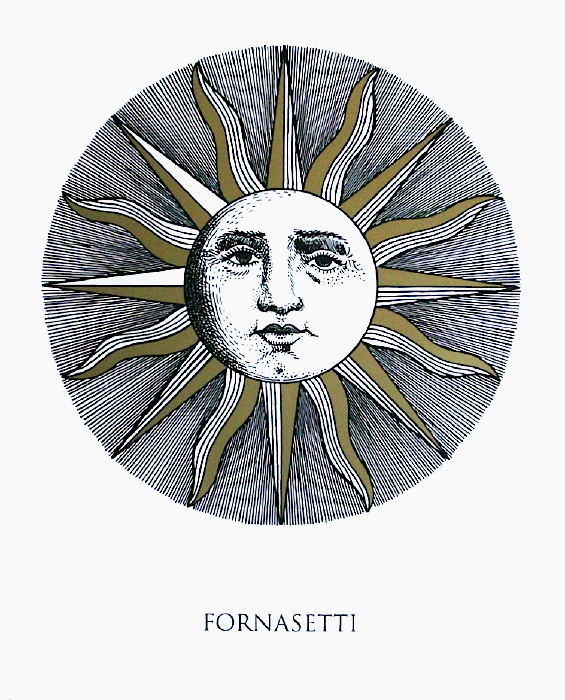 Photo from the Fornasetti website. 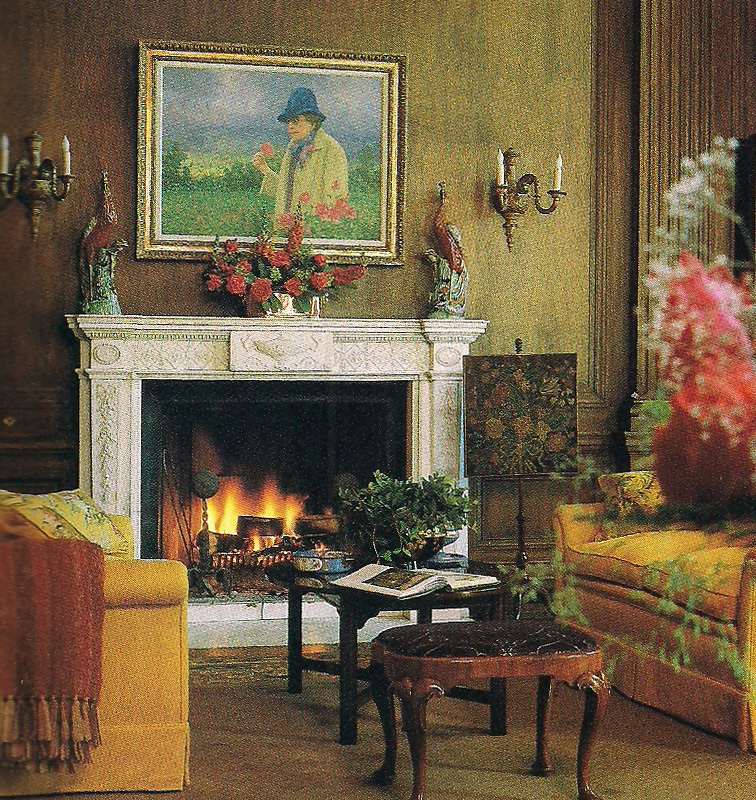 All the Robert Emmett Bright photos date from 1989 and were published in the January, 1990, issue of Architectural Digest magazine. 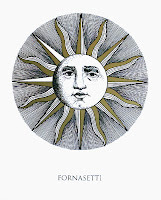 There are two books about Fornasetti currently in print; click on the title for more information or to order at a discount from the published price: FORNASETTI: DESIGNER OF DREAMS and FORNASETTI: THE COMPLETE UNIVERSE. from the collection of Dodie Rozekrans. Sothebys auction NO8818, lot 309. Somehow the original essay on Lacca Povera that was intended to be the current post appears as if it were published a week earlier; in case you missed it, it can be seen here. But while we're on the topic, I thought you Devoted Readers would enjoy seeing this bureau cabinet from the collection of the late San Francisco-based socialite Dodie Rosekrans sold at auction in 2011. This Venetian piece is Baroque in overall form, dating from the first half of the 18th century, but the concave sides of the base and the mid section reflect the coming Rococo style. 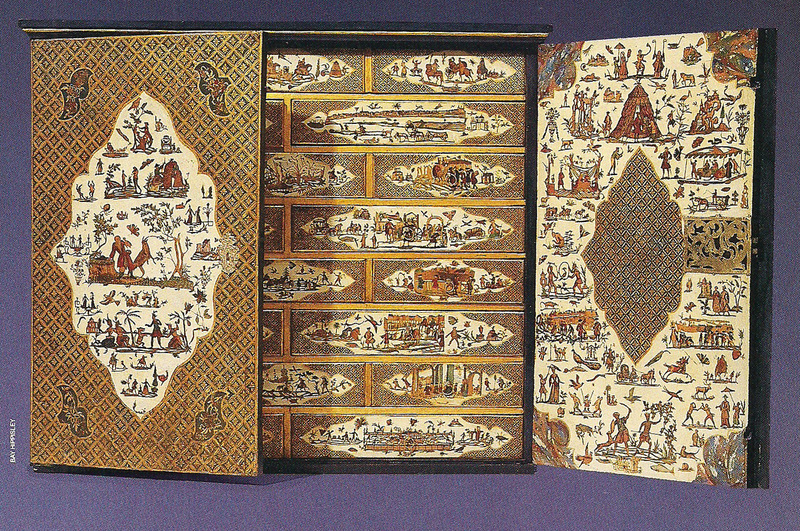 The pagoda top and oriental scenes identify this as being in the "alla cinese" taste. For more about the lady and the sale, see the post from the archives of The Style Saloniste by Diane Dorrans Saeks. 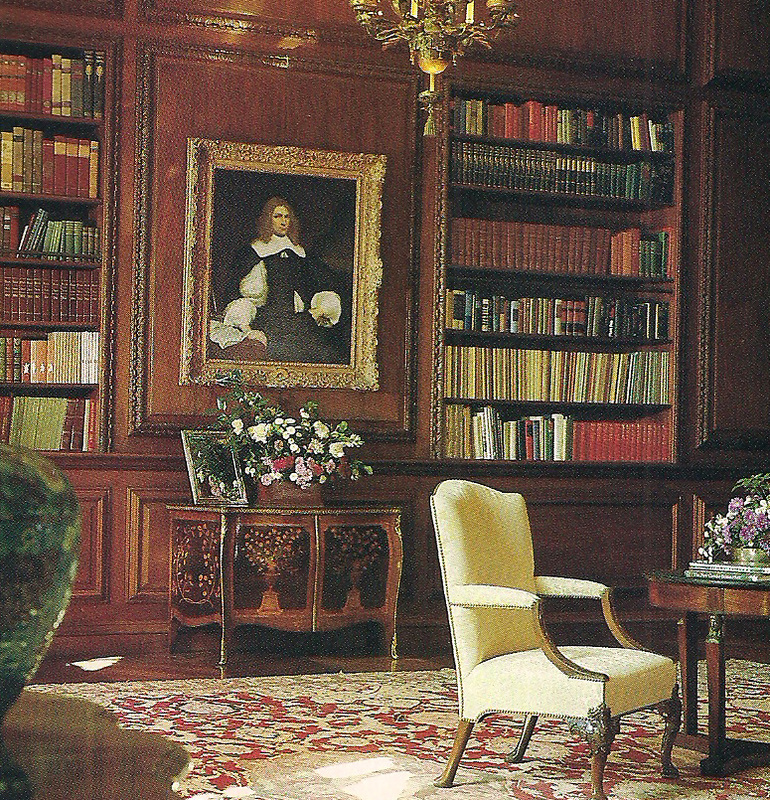 of interior designer Ann Getty. published by Rizzoli, October, 2012. And speaking of author Diane Dorrans Saeks, one of this season's stand-outs in new design books promises to be ANN GETTY INTERIOR STYLE. 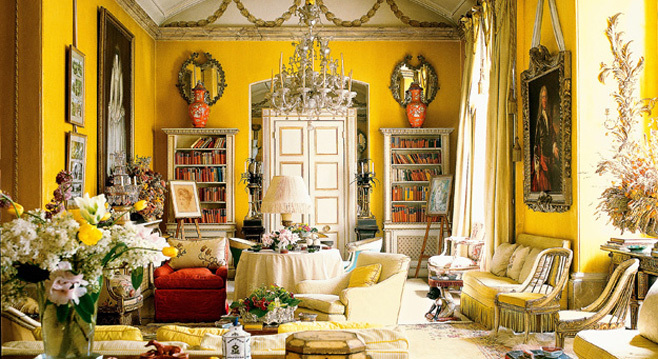 Although I have not yet seen the book, the preview photos reveal an insightful look at the lavish interiors created by the socialite and philanthropist Ann Getty, who founded her own interior design firm Ann Getty Associates in 1995. 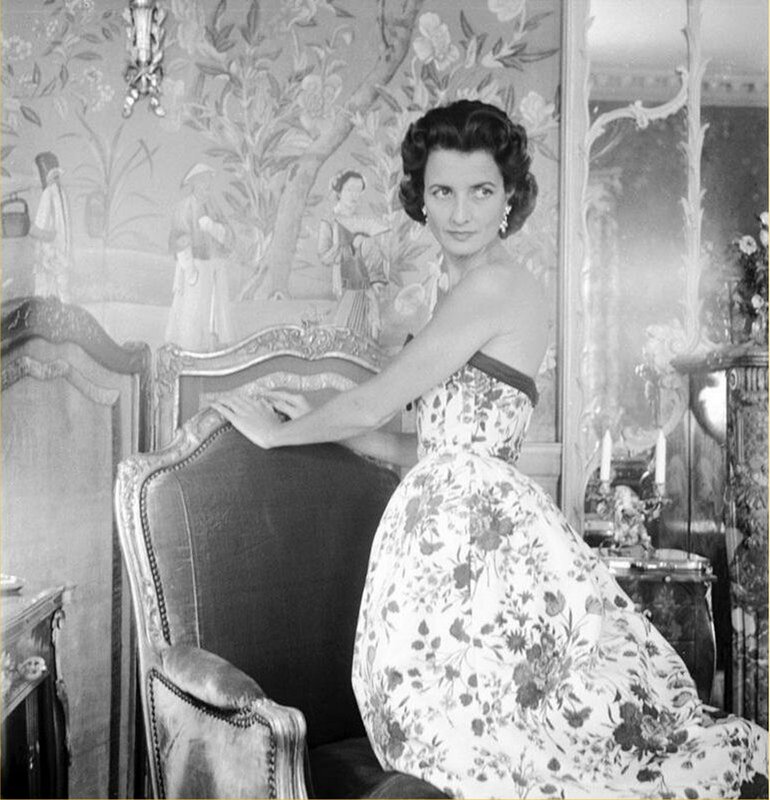 (A lady of great taste and a fortune to match, Mrs. Getty and her husband were valued clients of Parish-Hadley during my tenure there, although the Gettys worked on multiple residences with other design firms as well). 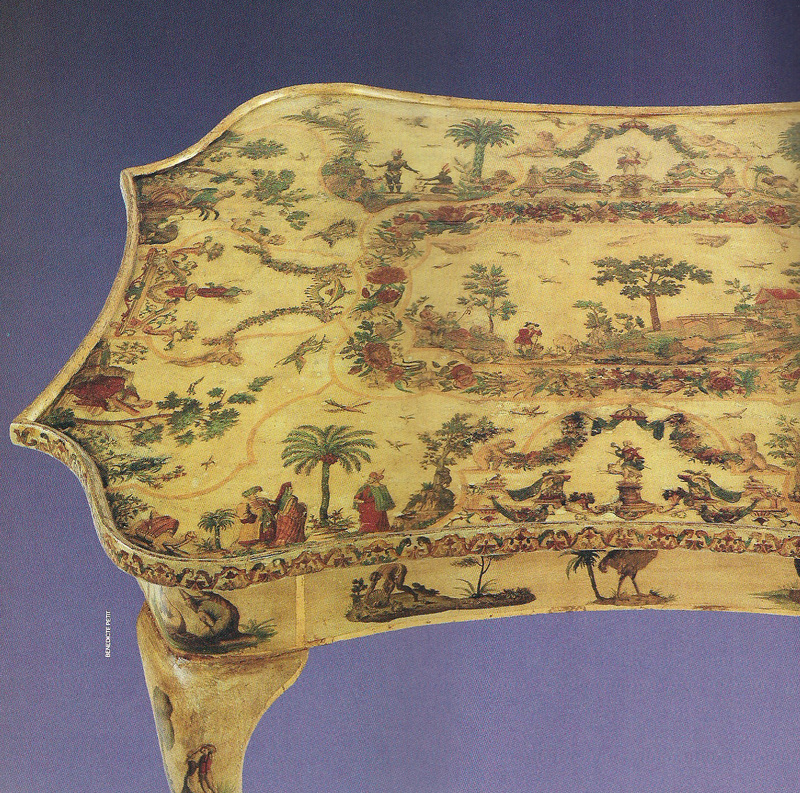 But back to the Lacca Povera technique, various European lacquer manufacturers' formulas differed in coloring and thickness of varnish, among other traits. While other Italian states tended to work with limited color palettes and forms, Venetian pieces were produced in a wider range of colors and forms. 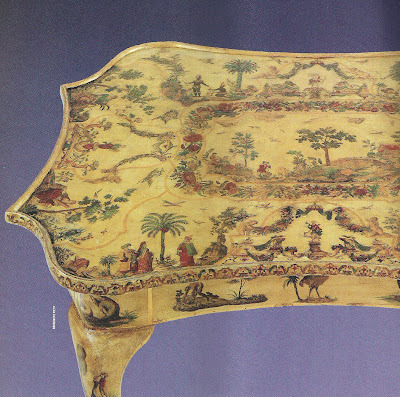 There was a 20th century revival of the technique that continues today, but the 18th century pieces are generally the most valued. Devoted Readers in London in the next few weeks are in for a very special treat. The noted decorating and antiques firm Sibyl Colefax & John Fowler is hosting a remarkable free exhibition of works by artist Rex Whistler from private collections and most have not been previously exhibited. 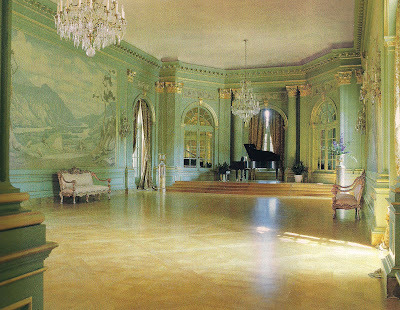 The exhibit, held in conjunction with the release of a new book IN SEARCH OF REX WHISTLER: HIS LIFE AND HIS WORK, will be held in the famous Yellow Room that had once served as part of the living quarters of legendary interior decorator Nancy Lancaster (a partner in the business founded by Sibyl Colefax). during the occupancy of Nancy Lancaster. The room has long been without the legendary decorator's furnishings, of course, but it is still interesting to see. It is a "must" for all devoted classicists. as published in Country Life magazine, 1939. See the recent posts about the art of the brilliant Rex Whistler in The Devoted Classicist by clicking on the title: Rex Whistler Murals, More of the Artistry of Rex Whistler, and Rex Whistler's Circle. 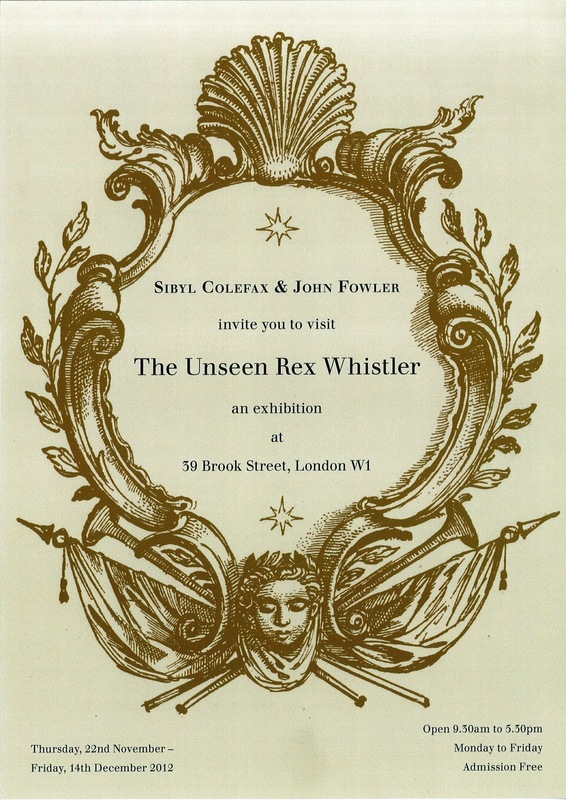 To see more information about the new book by Mirabel Cecil and Hugh Cecil or to order at a discount from the list price, click on the title: IN SEARCH OF REX WHISTLER: HIS LIFE AND HIS WORK. shows the allegorical theme of the continents. shows the later preferences for leisurely country pursuits. 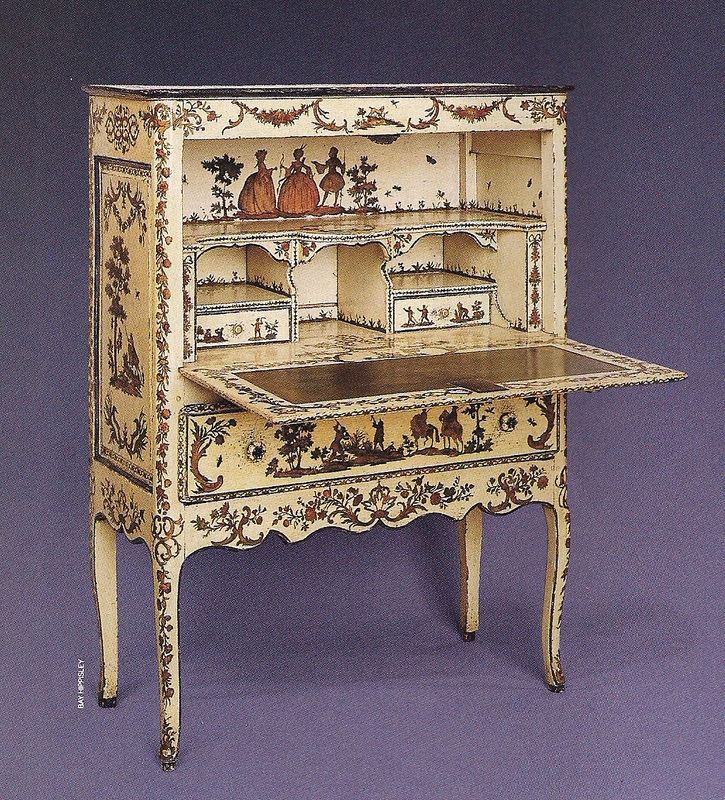 illustrates an answer to the 18th century demand for lacquer furniture. 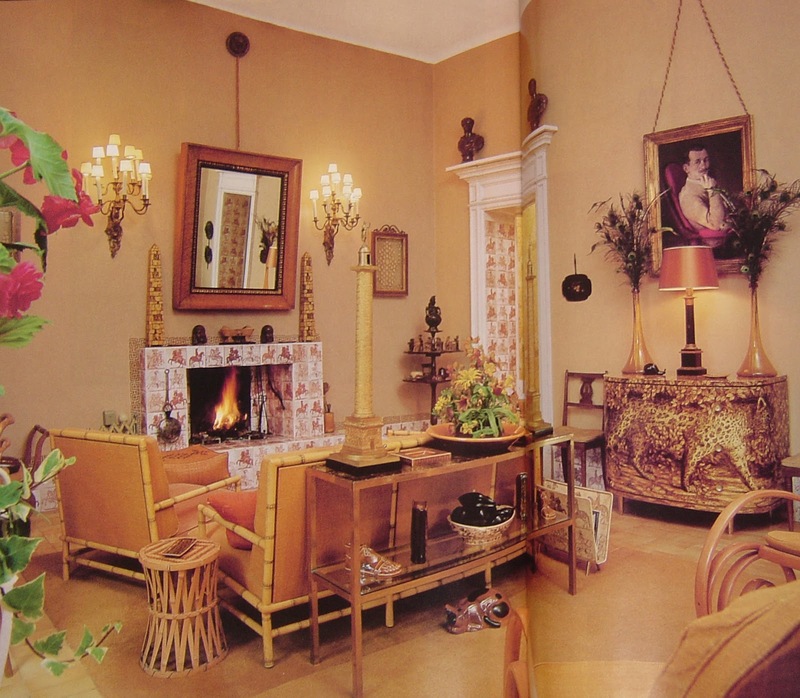 Other Italian cities produced Lacca Povera furniture as well, as did Paris and London at its height of popularity. To satisfy the demand for a less expensive version of the true lacquer decoration, printers produced sheets of engravings specifically for Lacca Povera decoration. 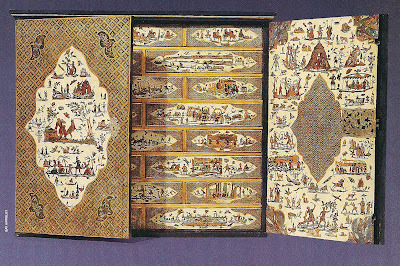 Chinoiserie figures, shepherds and sheperdesses, huntsmen, garlands, and bouquets of flowers are all common printed motifs. 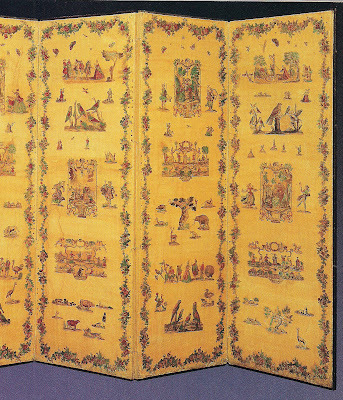 portrays the themes of mythology, courtship, and the Orient. 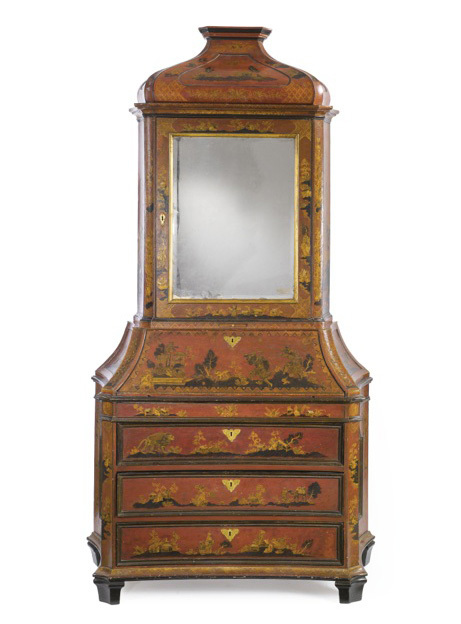 As interest in the classical revival style of Louis XVI resulted in the waning of the Roccoco period, the popularity of lacquer and Lacca Povera declined. By the time of the 1797 unopposed invasion of Venice by Napoleon's army, the city was no longer the great sea power and center of European banking, but already becoming a tourist center. the lavish frivolity of late Baroque and Rocco tastes. The charm of Lacca Povera furnishings is appreciated today, however, and occasionally a piece may be found in the most stylish interiors.